Back when I started using WordPress (around 2009), one of the first things that I had to understand when to use Posts and when to use Pages. Unfortunately for me and for many other WordPress users, the user interface in WordPress does not easily explain what the difference between Posts and Pages is. As I keep getting asked by clients as to when they should create a page rather than a post, I decided to write this article and finally explain the difference in a simple to understand manner. 1. Pages vs Posts: why the confusion? Consider for a moment the first thing that a new WordPress user sees on their newly established website. Confusing, right? Granted, there is a small Learn more about getting started link, but that page can be overwhelming for new users, so I’m positive that a good deal of people just close it after a few seconds. There’s another place where WordPress attempts to explain what Pages are (but not what Posts are). Please follow this closely. What many WordPress users will never notice is the little and shy “Help” button in the top right corner, which is present on all pages in the WordPress Dashboard. It contains some basic tips for the current page. Clicking the button will reveal a short explanation of what Pages are, but the same is not done for Posts for some reason. And that’s about all that we have. Posts are not explained at all. In a world in which people watch video tutorials on how to boil an egg, WordPress doesn’t even bother with explaining what Posts are. Should it do a better job at this? I think so. 2. What are Posts and when to use them? The easiest way to explain Posts is to think of them as regular news articles, which is what they are often used for. Posts are chronological. Each post has a “Published” date/time, which decides the order of a post in a list of posts. By default posts are sorted by their date of publication: the latest news are on top, the oldest news are at the bottom. This makes sense. You want to know exactly when a news article was published, so as to judge how relevant and useful it is to you at present. So any time when you want to write a piece of content, ask yourself this: is the published date important? Let’s look at some examples. When to create Posts instead of Pages? — You want to announce that your school has hired a new faculty member. This is a post, as the date of the announcement is important. — It is pumpkin season, so you want to publish a baked pumpkin recipe. This is also a post, as the date is important, and the recipe might not be as relevant 6 months from now. Other more recent posts will push this recipe down the list. — Your business runs a time-limited promo campaign with a discount. This should also be published as a post. 3. What are Pages and when to use them? An easy way to understand Pages is to think of them as static and timeless pieces of content. Even though Pages also have a Published date, they are usually sorted in alphabetical order, almost never by their creation date. Another difference is that Pages are hierarchical, which means that Pages can have “Child pages”, also known as nested pages. 3.1. When to create Pages instead of Posts? — You manage a museum website. You need a place to publish your opening hours and admission ticket prices. This should be a Page. — The Directions page is a Page. — The About Us page is a Page. In short, there are many types of WordPress websites that will often be comprised of only Pages and zero Posts. Consider this screenshot of Campbell University‘s homepage. None of the buttons/links in this screenshot lead to any Posts, only Pages. 3.2. Hierarchical Pages, what are they? One of the most important characteristics of Pages in WordPress is that they can be nested to create a treelike parent-child relationship. If you pay close attention to the URL of a page in the browser’s address bar, you will notice that a forward slash character ‘/’ will clearly indicate the treelike hierarchical structure of pages. Consider the website of Washington University in St. Louis. — https://wustl.edu/academics/ – a parent page called Academics. — https://wustl.edu/academics/academic-departments-programs/ – Academic Departments and Programs – child page of the Academics parent page. — https://wustl.edu/academics/centers-institutes/ – Centers and Institutes – child page of the Academics parent page, sibling of Academic Departments and Programs. You should carefully consider the importance of Page hierarchy on your website. Content should be organized and nested appropriately. If you manage a small website of a local museum with half a dozen pages on it, then this is probably not an issue for you. But if you manage a university or a school website with hundreds of pages, you should always arrange your pages in a logical hierarchy. In the beginning I promised you a quick and simple explanation of the difference between Posts and Pages. Hopefully I didn’t make matters worse for you! Are you someone who is just getting started with WordPress and is confused by the terminology? 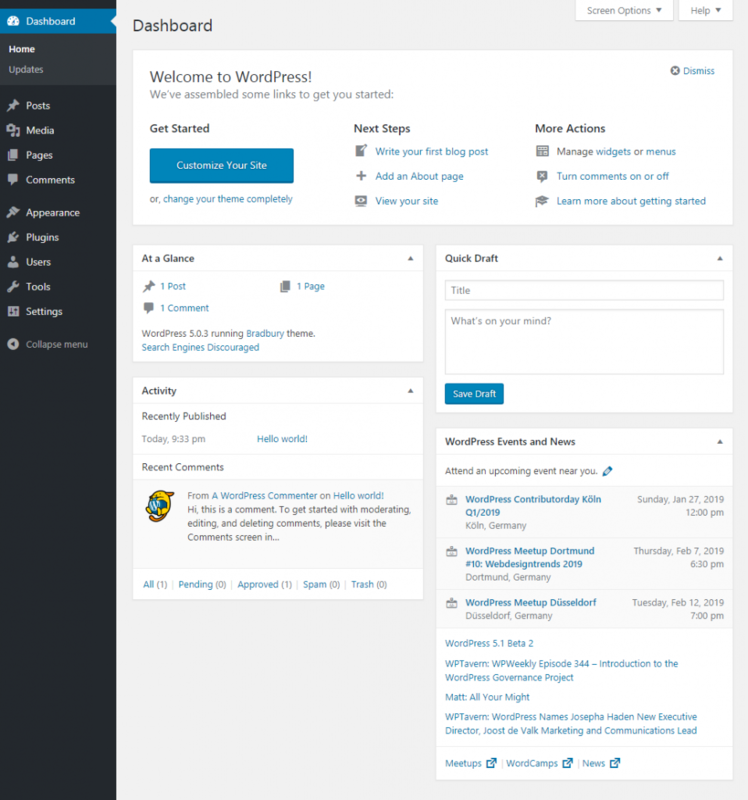 Do you think that WordPress should make getting started somewhat easier? Maybe a quick tutorial in the dashboard or a professionally produced 3-5 minutes video on the Home screen?